Baking powder recipe. 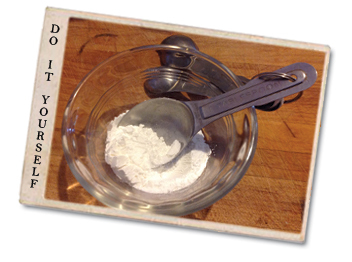 Make your own baking powder. Not a seasoning but a handy tip in case you ever run out of baking powder. Baking powder is used in all sorts of recipes from pancakes to breads and can easily be made if you keep baking soda and cream of tartar in your pantry. Mixed together. Makes 1 Tablespoon Baking Powder. Use right away. A note from David Edwards, "Baking powder is nothing more than baking soda that's been mixed with dry acids, as well as cornstarch or other "buffer" ingredients designed to keep the powder dry and prevent the ingredients from reacting prematurely. For every teaspoon of baking powder called for in your recipe, you'll need just 1/4 teaspoon of soda to replace its leavening action. You'll also need to furnish the necessary acidity, adding either 1/2 teaspoon of cream of tartar or a cup of buttermilk or soured milk to the recipe in place of sweet milk. Alternatively, add a tablespoon of lemon juice per cup of milk."